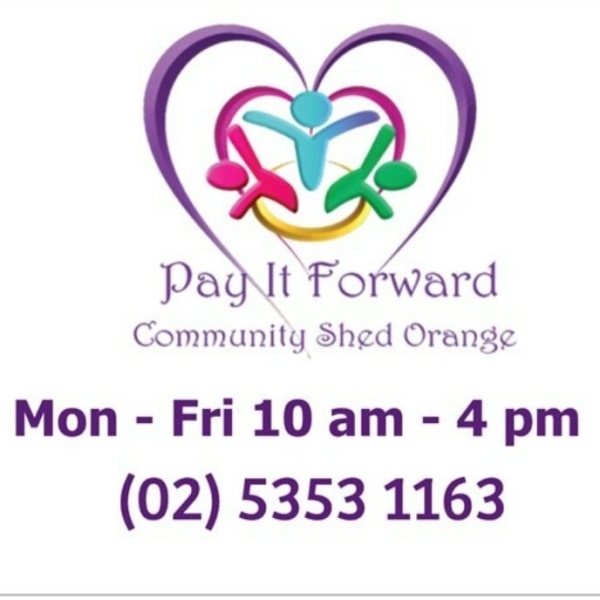 Pay It Forward Community Shed Orange - is a locally based Registered Charity in Orange NSW. PIF as its known to locals has become a Major Service Provider to those most vunerable members of the community and surrounding areas. 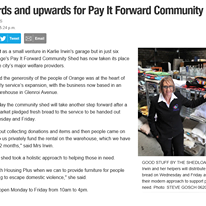 "A Charity that's making a real difference in the lives of people in need"
​​Late 2015 Karlie Irwin created the Pay It Forward Community Shed. 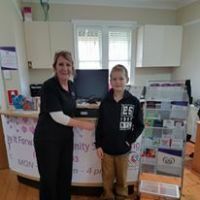 The Community Service Program was first started after Karlie recognised a gap in the way people in need were able to gain access to support services. Karlie has had an extensive Community Services Background and is a strong advocate for Social Justice. Karlie developed the Community Service Program in her own garage at home, building Pay It Forward from the ground up to make it one of the towns Major Charitable Service Providers in just 9 short months. PIF as its known to locals are offering support to those in need in a more modern and forward thinking approach and changing what "Charity" really means. 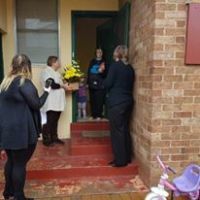 All services to the Community provided by PIF are at no cost to the recipient, PIF aims to reduce the financial stress of those experienceing crisis, trauma, DV, homelessness or simply living below the poverty line and struuggling to make ends meat. "All things are possible with compassion and caring"
PIF Charity offers a variety of different support programs for the community to access. FREE - whitegoods, furniture, clothing, household items, bric a brac and much more, stored in the onsite warehouse and free for the community to access. FREE - pick up and delivery service. 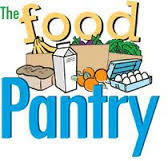 FREE Food Pantry access for food support, 8 weekly. FREE Fresh Bread Day - each Thursday. Fancy Dress Hire to promote inclusion and assist with funding of the Charity. $2.00 Pop Up Shop, located in the office area - to assist with funding of the Charity. PIF online Auctions - to assist with funding of the Charity. Beatification Program Lawn Support, Hire Lawn Mowers and Whipper Snippers for $2.00 each to assist to reduce risk of Homelessness through eviction for non maintanence of property, free pick up and delivery service. FREE Education and Training oppurtunities for people in need to enhance and develop employment oppurtunity, in partnership with training organisations. FREE Arts and Craft Program to address community engagement and isolation. 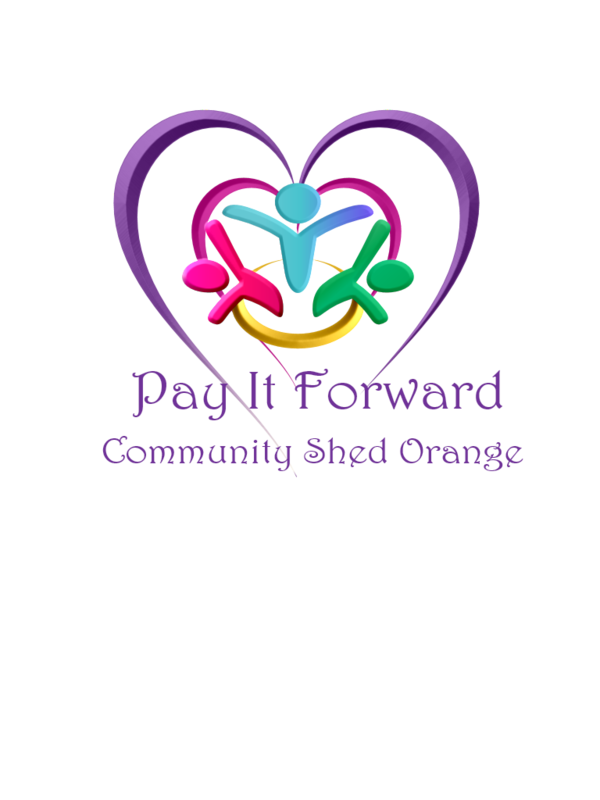 Pay It forward Community Shed is an open access service and offers support to the entire community. PIF operates under a donation system and redistributes all donated items back out into the community at no cost. 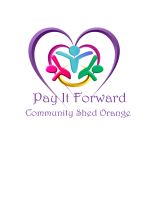 Pay It Forward is a privately funded Charity and recieves no government support or grants. 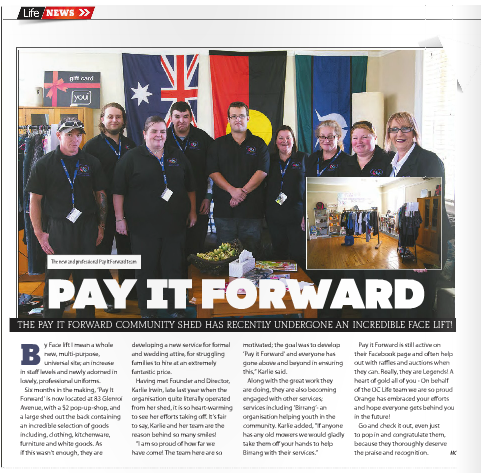 Pay It Forward is just that "Paying It Forward to those in need without financial gain in mind" and running the Charity at the most minimal costs to the community. All Staff including the Founder/Director are Volunteers. PIF has a wide range of services to support those in need. 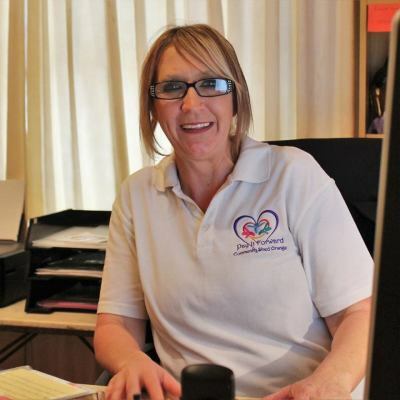 Visit our business page to the the amazing work and products available and to see the amazing stories of support.